JustWordz: I'm a Guest Designer!!!!! Nicole is the most fantastic sharing lady I've met on blogland... When i was just a newbie....this past January i came across her blog thinking she was in Sudbury Ontario by her blog name. Turns out she's not but that didn't stop her from helping me when i needed it. I was so new.....how new....you know NEW...i had the most stupid questions but she helped me along and boy am i thankful...I had no idea what i was doing. So she still hasn't stopped, she's invited me to be a guest designer on her blog today. Helping me share the word about my new release stamps sets. And some exciting news about a new artist in blogland who just happens to be my niece. 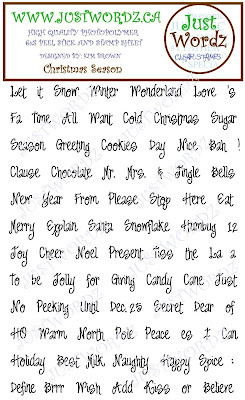 I have two new stamp sets that I'm super excited about.. Party Time and Christmas Season. 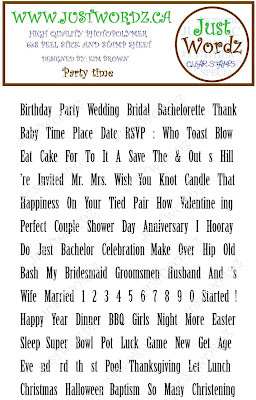 They are a variety of words that you can mix and match to create a multitude of sentiments. They can be purchased here: http://www.etsy.com/shop/JUSTWORDZ For this week only i have a special going on for those who would love to own these sets at a great deal. Use coupon code NEWRELEASE and you will save 15% off the ticket price. Oh i so love this image...colored with promarkers, JUSTWORDZ Christmas Season stamp set. Added a charm and some trendy twine to finish it off. Thank YOU Nicole, you are the BEST!!!. Kim, this is gorgeous. Love your colouring as always and Sheryl's digis are too cute! Awe, thanks Heather and Coops! And Kim - I just LOVE what you have done with my Christmas girly! Good luck with your guest designing too! It sure sounds like you are going to be a busy gal! I don't know where you find the time...honestly. There just isn't enough hours in a day sometimes. I sure wish I could do this full time forever - it's so much fun!